p38 mitogen-activated protein (MAP) kinase (p38α) has drawn attention as a new target molecule for the treatment and diagnosis of cancer, and its overexpression and activation have been reported in various types of cancer. 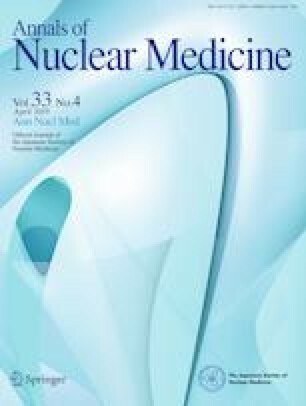 In this study, a single photon emission computed tomography (SPECT) imaging probe of p38α was developed to noninvasively image p38α activity for effective qualitative diagnosis of cancer. Pyrrolepyridine derivatives, m-YTM and p-YTM, were designed and synthesized based on the structure of the p38α-selective inhibitor. Radioactive iodine-labeled m-YTM, [125I]m-YTM, was synthesized because m-YTM greatly inhibited the phosphorylation of p38α upon examining the inhibitory effects of the compounds. After investigating the binding affinity of [125I]m-YTM to the recombinant p38α, a saturation binding experiment using activated p38α and inactive p38α was performed to determine the binding site. Uptake of [125I]m-YTM into various cancer cell lines was investigated, and the pharmacokinetics was evaluated using tumor-bearing mice. The inhibitory activity of m-YTM was approximately 13 times higher than that of SB203580, a p38α-selective inhibitor. The binding site of [125I]m-YTM was estimated to be the p38α activating site, similar to that of SB203580, because the [125I]m-YTM bound strongly to both activated p38α and inactive p38α. Various different cancer cells incorporated [125I]m-YTM; however, its accumulation was significantly reduced by treatment with SB203580. Pharmacokinetics study of [125I]m-YTM in B-16 tumor-bearing mice was examined which revealed high accumulation of radioactivity in tumor tissues. The ratios of radioactivity in the B-16 tumor to that in blood were 3.1 and 50 after 1 and 24 h, respectively. The ratio of radioactivity in the tumor to that in blood in the tumor-bearing mice generated using other cancer cell lines was also ≥ 1 at 1 h after the administration of the probe. This study suggests that [123I]m-YTM has potential as a p38α imaging probe effective for various cancer types. This work was partly supported by a Grant-in-Aid for Scientific Research from the Japan Society for the Promotion of Science (No. 12770512). There are no conflicts of interest.